Thanking those who have helped make this a momentous year. Everywhere you look, the University of Washington is having an impact—expanding our shared knowledge, improving communities, saving lives and giving back to the people and places that have helped make our University so extraordinary. This month, we launch a new class of graduates who will leave their mark—the Class of 2017—adding more than 15,000 new alumni to the ranks. Commencement is always a great moment to reflect on the academic year behind us—a year that has both tested us and our community, and deepened our sense of mission and purpose. I’m proud that the Center for World University Rankings, which ranks the world’s elite universities in the STEM and social sciences, named the UW 9th in the world, with 45 disciplines ranked in the top 10! Tackling knotty, intractable problems is necessary to help people flourish. And it is what drives our community of scholars, teachers, students and alumni. We are confident that this new class of graduates leaves the UW with a deep understanding of our public promise, prepared for a lifetime filled with satisfaction and meaning in their work, families and communities. They have made a great impact on our University and our community and we will miss them! One particular alumnus whose impact continues to be felt is Norman Rice, profiled in this issue, who is this year’s recipient of the Alumnus Summa Laude Dignatus Award, the highest honor we bestow on an alumnus. As Seattle’s mayor, Norman was a path-breaking leader who helped make Seattle the vibrant, livable city it is today. A practitioner of inclusive innovation before it had a name, he’s a “Double Dawg,” having received his bachelor’s and Master of Public Administration degrees from the UW. So many of you, through your advocacy and involvement, have helped make this a momentous year. Our academic calendar began with the public launch of Be Boundless, the most ambitious philanthropic campaign in our history. Nine months on, the campaign has achieved an important milestone—thanks to more than 320,000 individual donors, we recently crossed the $4 billion threshold. 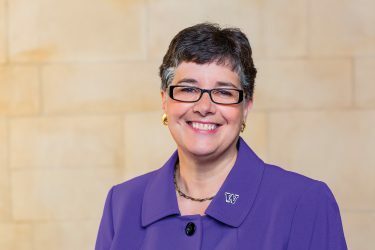 This momentum is a powerful testament to the fact that supporting the UW is a sure means of addressing the causes and issues—be it student access, climate research, supporting the arts or curing cancer—that matter most to you. We are honored to serve those causes with you. As alumni and friends of the UW, your continued engagement with us is what makes all these achievements and accolades possible. Maybe you came to campus this year to visit one of our museums, theater or arts performances, to attend a faculty lecture, or to visit your student at Parent & Family Weekend; or maybe it’s been years since you set foot on campus, but you’re still in contact with one of your faculty mentors. Maybe you can’t wait to page through Columns Magazine to see what’s new at the UW, or maybe you helped organize your class reunion. However you stay connected to the UW, we’re proud to be a part of your past, present and future. Thank you for all that you do.